Jose Fragozo, right, his attorney Manuel Torres before Superior Court Judge William Gentry Jr. Facing 13 counts of election and voting fraud, Escondido Union School District (EUSD) trustee Jose Fragozo Monday pleaded guilty to one of the lesser felony counts in a plea bargain agreement. The remaining 12 charges were dismissed. Fragozo entered his guilty plea mere hours after a 55-member jury pool was brought into court. They were being interviewed about participating in a trial expected to last through Labor Day. He has been free without bail since February when charges were presented to Vista Superior Court Judge James A. Mangione. Fragozo must resign from the school board and not run for public office until 2019. The 13 charges related to the Nov. 4, 2014 school board election during which Fragozo claimed to live within a newly drawn district. His plea affirms he didn’t. Other charges related to alleged perjury, false voter registration and filing false documents. Fragozo could have faced nine years and four months in prison of convicted on the 13 counts. He now faces a Sept. 28 sentencing by Vista Superior Court Judge Harry Elias that could result in three years of some form of punishment. However, Elias reportedly said Monday he might reduce the guilty charge to a misdemeanor with probation as punishment. 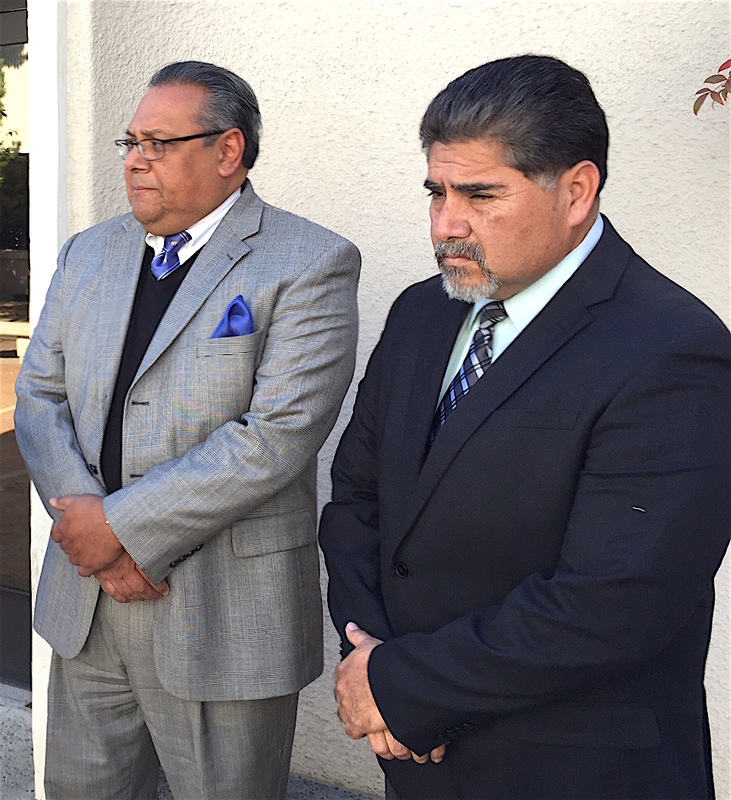 Attorney Manuel Torres and EUSD trustee Jose Fragozo outside Vista court Thursday. Board President Joan Gardner, who reported Fragozo for alleged election fraud to authorities two years ago, was quoted Monday as saying she was pleased with a guilty plea, but still has reservations about the outcome. 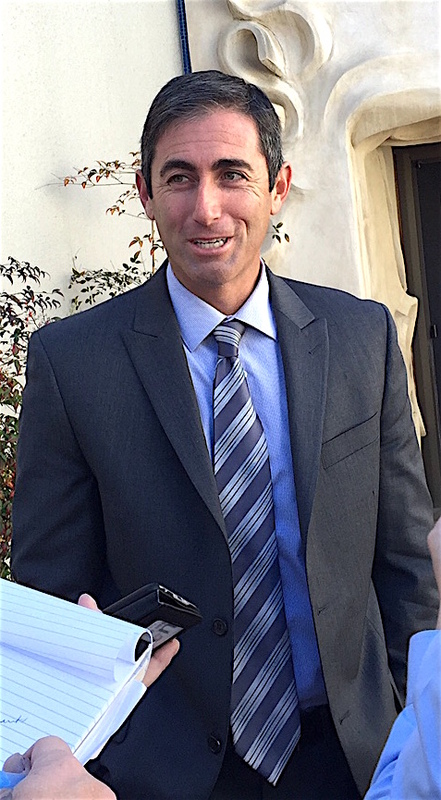 San Diego Deputy District Attorney Leon Schorr outside Vista Court Thursday. Publicly released search warrants citing concerns about Fragozo’s residence dated to a July 16, 2012 complaint. Search warrants filed by the District Attorney’s office said its investigators had been looking into Fragozo’s reported 305 South Maple St. address since Aug. 31, 2015. He changed his address to that apartment two days before filing his candidacy papers on July 14, 2012. Fragozo also owns a four-bedroom, 3,600-square-foot home at 28346 Crooked oak Lane in Hidden Meadows. His wife lives at that home, and Fragozo said they were separated. She attended the Thursday arraignment hearing, sitting by Fragozo. State law says candidates must live at only one residence in the district they seek to represent. This was the latest in a series of EUSD proceedings that began Dec. 2, 2015 with superintendent Luis Rankins-Ibarra and four colleagues filing a temporary restraining order to keep Fragozo 300 yards from school property and meetings. Ibarra et. al. contended Fragozo behaved in a threatening manner while discussing various school issues. Those included Fragozo, according to court accounts, not receiving board agenda packets and his questioning of the direction of district English as a Second Language efforts and declining school enrollment. Fragozo flatly denied Ibarra’s allegations, saying he merely disagreed with Ibarra and company, and they were blowing up the situation to silence him. Be the first to comment on "Fragozo pleads guilty to voter fraud count"